Ruka, Finland – Sadie Bjornsen, of Winthrop, Wash., and Jessie Diggins, of Afton, Minn., led the U.S. Cross Country Ski Team with solid 14th and 16th place finishes, after the second stage of the Ruka Triple in a 5k freestyle race on Saturday. The finish boosted Bjornsen into 11th in the standings after two stages of the mini-tour. “I am looking forward to some more skating opportunities this season, because the race was so closely packed, and I know for sure there are things I can improve in the future,” Bjornsen said. In the woman’s competition, Norway’s Therese Johaug dominated the race with a 17.6-second lead over Charlotte Kalla of Sweden after getting tripped up climbing the last hill into the stadium, followed by Sweden’s Ida Ingemarsdotter in third. 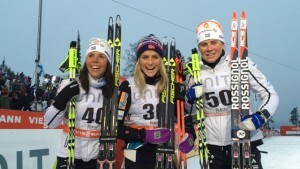 Johaug leads the tour. Norway’s Martin Sundby won the men’s 10k finishing over Canada’s Alex Harvey and Dario Cologna of Switzerland to take the tour lead with one stage to go. Simi Hamilton, of Aspen, Colo., was top American in 49th. The final stage of the Ruka Triple wraps up Sunday with a 15k/10k classic pursuit race. It will be streamed live on NBC Sports Live Extra with women at 4:15 a.m. EST and men at 5:30 a.m. EST. Rank Nation Name Total Time Diff.